No, it is not. It may be “custom,” “Made-to-Measure,” “Demi-mesure,” “Personal tailoring” or any one of a dozen other terms. And the product, when produced by a reputable and caring company will be a very good one. An individually cut pattern for each client produced by the Master Cutter. Personal supervision of the production of the garment by the Master Cutter. Cutters and Tailors trained to the Savile Row standard. At least 50 hours of work in a typical 2 piece garment that is produced almost entirely by hand. Provide expert cloth consultation services on premises. Offer at least 2000 fabrics, some of which may be exclusive. Provide first class after care including sponging, pressing, repairs and button matching. 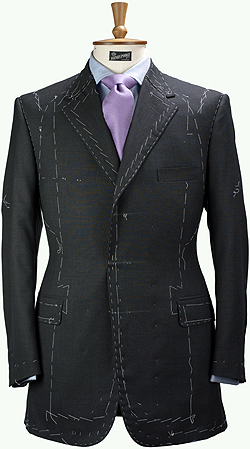 Find The Savile Row Bespoke garment specifications in the handy interactive page here. Caveat Emptor. Get what you are paying for. This entry was posted in Elegantology and tagged bespoke, Elegantology, Savile Row, tailoring. Bookmark the permalink. 6 Responses to Caveat Emptor. Gone, HOBAC, are the days of Mr. Ogilvy. Too true. Sacrilege. So much for the ASA being “legal, decent, honest and truthful”. Lovely to hear you had a great 4th of July and may I ask is Mrs E as elegant as you? Eva, it does give one pause, doesn’t it? Hi TIG, you said a mouthful. ATBaB, you can find good bespoke in HK, according to the London Lounge guys. But you have to know where to look. I have a friend who had a few suits made, they were claimed to be bespoke. They came out nice enough. Mrs. E. is less obsessed than I and more naturally elegant.